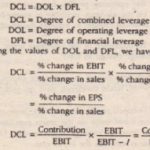 As a rule, when a percentage change in EPS resulting from a given percentage change in EBIT is greater than the percentage change in EBIT, financial leverage exists. 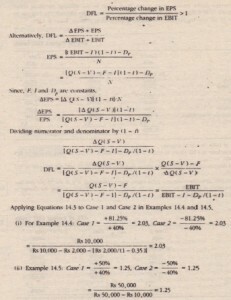 In other words, financial leverage occurs when the quotient in Equation 14.3 is more than one. In both the examples, the relevant quotient is larger than one. Therefore, financial leverage exists. But the degree of financial leverage is higher in the quotient of percentage change in EPS due to percentage change in EBIT, the greater is the degree of financial leverage. 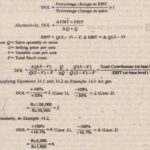 The quotient of 2.03 implies that 1 per cent change in EBIT will cause 2.03 per cent change in EPS in the same direction (+ increase/decrease) in which the EBIT changes. 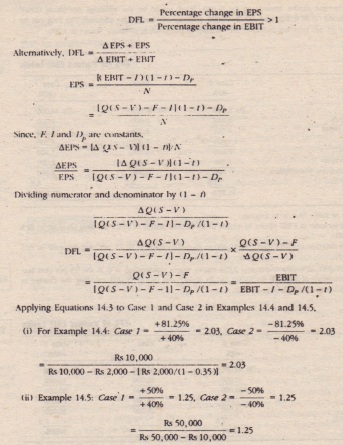 With 1.25 quotient the proportionate change in EPS as a result of 1 per cent change in EBIT will he comparatively less, that is. 1.25 per cent in either direction. There will be, however, no financial leverage, if there is no fixed-charged financing.